Position of A in the linear equation. Left 1 This node solves the linear equation op(A) * trsm = alpha * B, where trsm represents dtrsm or ztrsm. Right 0 This node solves the linear equation trsm * op(A) = alpha * B, where trsm represents dtrsm or ztrsm. Triangular matrix of at least K rows and K columns. This node uses the first K rows and K columns in op(A) for the calculation. K × N matrix, if side is Left, or N × K matrix, if side is Right. Matrix of the same size as B. 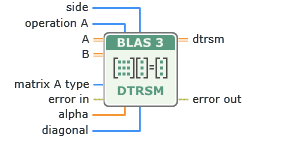 If side is Left, this output returns the result of op(A) * dtrsm = alpha * B solved for dtrsm. If side is Right, this output returns the result of dtrsm * op(A) = alpha * B solved for dtrsm. This input is available only if you wire a 2D array of double-precision, floating-point numbers to A or B. If side is Left, this output returns the result of op(A) * ztrsm = alpha * B solved for ztrsm. If side is Right, this output returns the result of ztrsm * op(A) = alpha * B solved for ztrsm. This input is available only if you wire a 2D array of complex double-precision, floating-point numbers to A or B.